As most travel guides point out, travelling to Zambia or Zimbabwe, and not visiting the Victoria Falls, would be like visiting Egypt and not seeing the Pyramids. But there is so much more to do in this area that you could spend an entire holiday here. Our purpose herein is to summarise everything that you need to know about the area, whilst offering our own services in planning your trip. 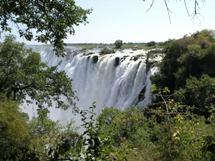 A number of our guests have initially been lukewarm at the prospect of visiting Victoria Falls. In every instance their attitude has stemmed from a disappointing experience at the over-commercialised Niagara Falls. 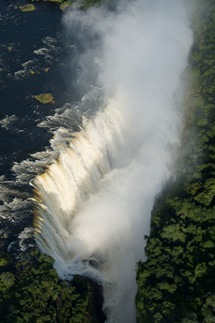 Rest assured – Victoria Falls is totally unspoilt. 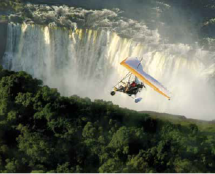 Indeed one of our guests, seeing the Falls for the first time after a journey lasting over 16 hours, texted us to say that if he had to fly back the very same day his journey would have been worth it just to experience such an awesome sight. The key issue is that of what is the best time of year to visit, since the water level, and hence flow rate, of the Upper Zambezi River that feeds the Falls determines the type of experience that you will get. In turn this depends on rainfall many months previous, over 2,000 km to the north, close to the point where Zambia, Angola and the Democratic Republic of Congo all meet up. Peak flow is therefore reached in the March to May period, with the lowest water levels coming in October to December (even though the rainy season here is November to March). Somewhat bizarrely, there are two totally different points of view about when to gain the best experience. One is that it is best to visit at full flow, in order to experience the incredible power of the Falls at this time. The other is that you should visit much later in the year so that the massive clouds of spray can be avoided, and much more can be seen of the surroundings. We ourselves are totally convinced that the first point of view is the correct one (the images opposite demonstrate how the experience actually differs). We would always prefer the extraordinary and unique experience that the full flow provides, to that of a trickle of water coming over a barren rock face. As the video above demonstrates, you can actually feel, as well as hear. the power of The Falls. 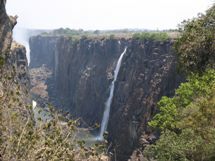 In a way, it's all a question as to whether you wish to view the Victoria Falls, or the Victoria Cliffs! To us there is little sorrier experience than seeing numbers of tourists who come in for a day or so from, say Botswana or South Africa, to view the Falls, and end up going away dismayed and disappointed, having seen very little water actually falling. We largely blame their Tour operator. In fact, if you know what you are doing, you can actually optimise the experience by choosing to view the Falls from either the Zambia side or the Zimbabwe side, and we go to a lot of length to explain how you can get the very best out of your stay here. Many people see their visit here as a one or two night dash, just to see the Falls, but in fact there is so much else to do in the area that you could readily spend a very productive week here. The cost of accommodation in the area of The falls is much lower than out on safari as well, and hence it is possible to extend your trip very productively in this way, truly creating 'the holiday of a lifetime'.